The Henderson Historical Society would like to encourage our current and former residents to submit their stories and tell us what you remember. Feel free to upload your story as a Word document, or PDF or just write your story in the space provided below. Please DO NOT upload any photos greater than 5 MBs. 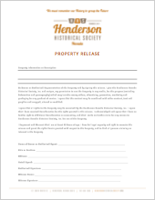 All submissions must be accompanied by a Henderson Historical Society Property Release. This form may be filled out in one of two ways. Printed out, signed and scanned and uploaded using the form below. Thank you for your submission. After review it will be posted to website.